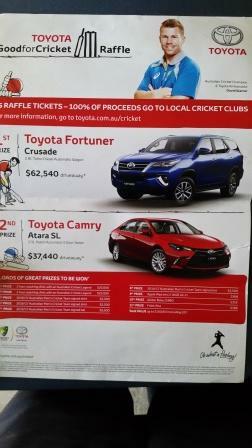 All families and friends are requested to please support the club by participating in the Toyota Good For Cricket Raffle. Excellent prizes, including 2 cars are on offer and every dollar raised goes directly to Nuna CC. Ticket books (10 tickets @ $5 each per book) will be allocated this week. All junior players are requested to please sell at least one book. All books must be returned by the 25th of January.